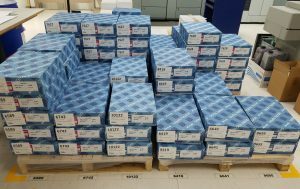 Nick Shonsky, Director of Continuous Improvement at The Standard Group in Lancaster and Reading Pa., recently shared with us the power of some of our smallest products – our Superior Mark™ Label Protectors. The Standard Group has been has been helping marketers and advertisers simplify their print management and marketing logistics solutions through printing and packaging, personalized 1:1 communication, integrated direct mail, marketing management portals, fulfillment and promotional products. Nick has been driving their Continuous Improvement / LEAN initiative and concentrates on keeping the facility workflow efficient and at optimal productivity. 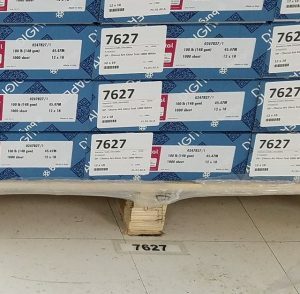 About a year ago, The Standard Group started marking off its warehouse floors with tape and Nick started looking at different floor marking styles and products. “I found Stop-painting.com back then. After the results of my research it was then determined that my budget for marking the floors here would not allow for the quality of tape that your company had to offer and we got vinyl tape from U-line instead,” Nick said. The Superior Mark™ Label Protectors proved to be a great solution for Nick and the press team’s warehouse visual organization needs. After seeing the label protector samples hold up so well, Nick placed an order for more and is using them in his warehouse. Labels are important in a work area. They’re visual devices or cues that indicate what goes where. 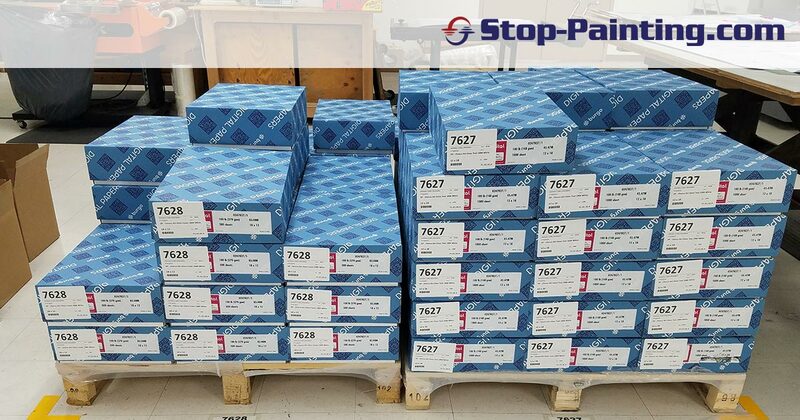 Warehouse labels are used for tool or inventory placement/replacement, warehouse inventory picking, inventory locating services, bin or tote identification and aisle identification. Whether you’re using 5S & Lean processes in your workplace or just supporting a visual workplace, utilizing labels can keep your workflow productive and efficient. Our Superior Mark™ Label Protectors are the perfect solution for enhancing the durability and lifespan of your warehouse labels. Our label protectors are made from Superior Mark™ Floor Tape and offer the same superlative qualities as our color labels – but in a clear, see-through rubber. These labels serve as a protective shield over other labels and stickers that might otherwise get rubbed, scraped or damaged – and labels are no good if you can’t see them or read the message. Superior Mark™ Label Protectors will shield your floor labels, shelf labels, and equipment labels so that your warehouse remains organized and user friendly. You can purchase our label protectors already cut into the correct size, or you can purchase a roll of Superior Mark™ Clear Tape and cut to size yourself. Nick says The Standard Group has several facilities, including a warehouse with concrete floors (where the label protectors are being used), as well as a building built in the late 1800’s with wooden floors throughout. In a building with wooden floors, removable adhesive tape is the better choice over painting. As a continuous improvement manager, Nick is well aware of the constant balance of cost of products versus quality of products. “As you probably know, there is a tradeoff for the cheap tape versus the good- quality floor tape. I put a strip of your 2″ tape down when we first got the sample box a year ago and it is still holding up strong where my cheaper tape gets torn up sometimes hours after I apply it!” Nick said. Like Nick and The Standard Group, many of our customers know the value of visual organization and using our tools, but start off with small areas, hoping to invest in more products as productivity increases. We liked that Nick compared our products with other competing tapes and found what works best for him, factoring in long-term use costs versus up-front cost at purchase. Superior Mark™ will typically prove to be the better buy with long-term cost comparisons considered. Superior Mark™ Floor Tape is produced in our facility in Wake Forest, NC and is the most durable and highest quality floor tape you’ll find. Superior Mark™ Floor Tape has a patented design with beveled edges and a recessed, highway grade adhesive for durability and top performance that sets the standard in industrial strength marking tape. Nothing beats Superior Mark™ Floor Tape for fast installation, easy maintenance and maximum strength that holds up under the heaviest industrial traffic. Are you interested in comparing Superior Mark™ Floor Tape to other tapes in your facility? Give us a call and we can help you set up a test area and provide some Superior Mark™ Floor Tape for your comparisons. Visit our website or call 1-866-284-1541.